Each year when the temperature dips and the leaves start to turn colour, I think "this year I'm going to do a corn maze". I know, it seems like a simple thing that I should easily be able to check off my list. But, for some reason the corn maze has eluded me! Well, last weekend I was successful in my mission! To celebrate my niece Madison's birthday, we took a trip to Kusterman's farm. What an awesome day we had! Despite the chilly temperatures, the sun was shining and we had so much fun. 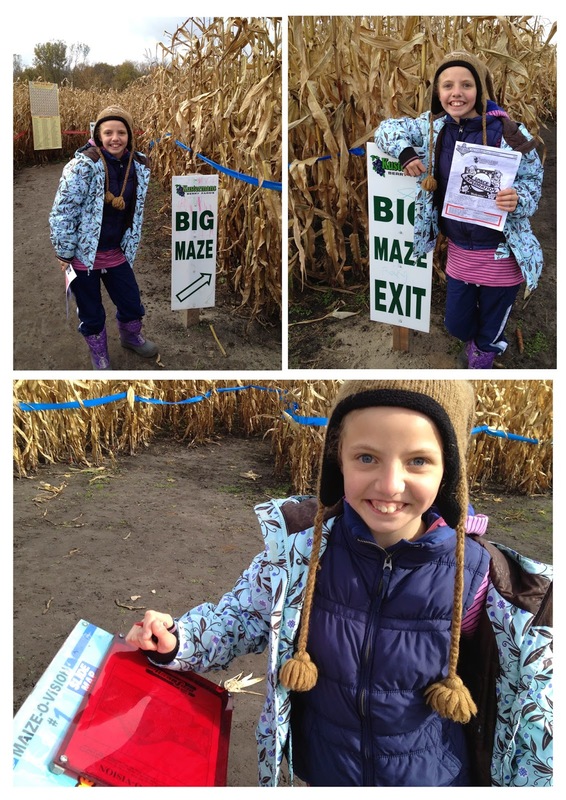 The corn maze took us about 2 hours but we both loved the challenge. We wandered our way through - looking for the various "stations" and completing the coordinating data on our paper. The theme this year was space, so we learned lots of tidbits along the way about the solar system, galaxies and the equipment used to get astronauts into the space. We also enjoyed a wagon ride back to the pumpkin patch where we searched for just the right pumpkin. Madison really enjoyed checking out the animals, especially the budgies! There's tons of stuff to entertain kids of all ages at Kustermans - we had a lot of fun together and left exhausted! Madison is such a great kid - full of facts (especially facts pertaining to animals!) and loves to tell stories and jokes. Thanks for the fun day Madison!